We pick up guests at their Waikiki area hotel between 5:50 – 6:10AM and arrive at our shop at 6:30 am (if you are meeting us at the shop, meet time is 6:30AM at this location). From there we fill out the necessary paperwork, gear up and get onto the boat. We launch about 7:00 am and head out to our first dive site (normally a deep wreck dive). After the first dive, we change out the tanks while you enjoy complementary snacks and water. During our surface interval, we motor to our second dive site which is usually a shallow reef or drift dive. Once we complete our second dive, we head back to the marina and offload; while we unload you have time to visit our shop to pick up a t-shirt, hoodie, hat or more, fill in and stamp your log book or grab a shave ice near-by. We are back in the shuttle at 10:30 and dropping you off at your Waikiki hotel around 11:00 AM. 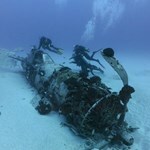 One of the things that sets Oahu apart from the other Hawaiian Islands are the numerous wreck dives available. 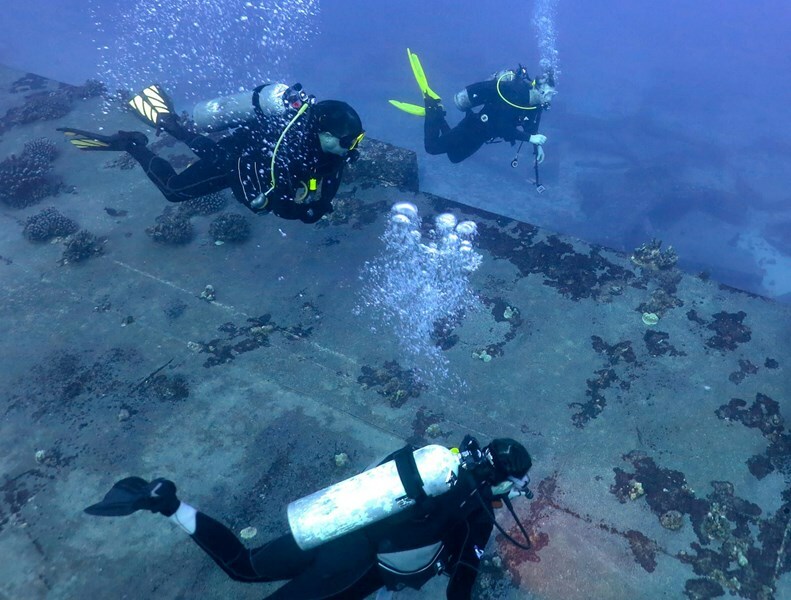 Aside from the wrecks themselves, these dive sites tend to be the preferred cruising areas of the larger animals such as sharks, rays and whales during winter months. 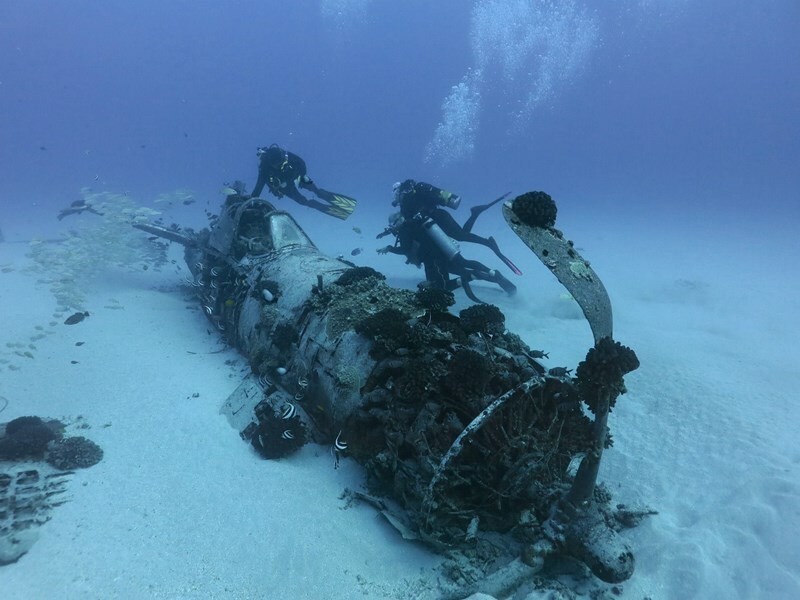 Sunken barges, and old landing craft (that sharks like to call home), and Hawaii’s most famous wreck, the WWII Corsair Plane Wreck are all right off Oahu’s southeast coast just waiting to be explored. As we only take a maximum of six divers per trip on our Oahu dive boat, you won’t have to worry about the dive sites being crowded. Additionally our wreck dives are the first dives of the day, and our dive boat leaves 30-45 minutes prior to the other local area shops. That means we get to the sites first, before everything is scared away! 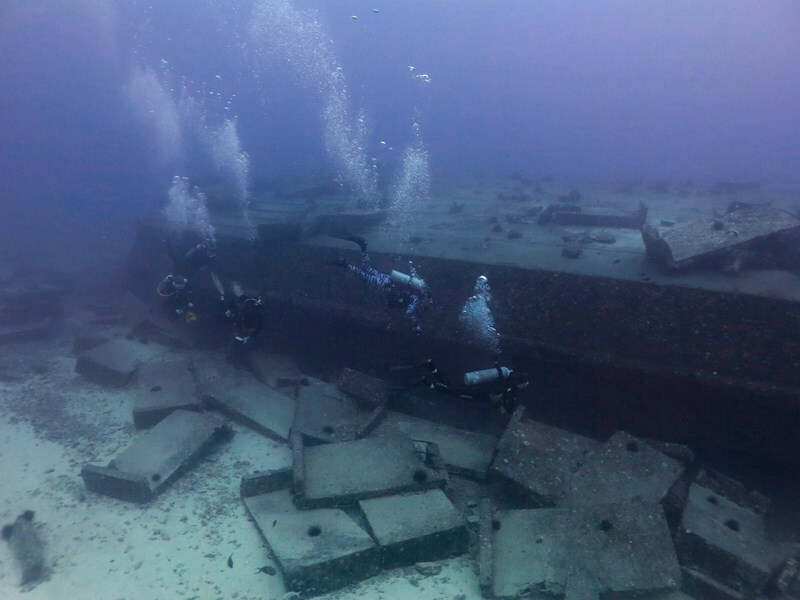 Most of the wrecks we dive sit between 70 – 110′, so a minimum of basic open water certification is required. 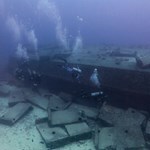 One of our wrecks, Baby Barge begins at 60 feet which is a great introduction deep dive and a great dive for our Junior Divers under instruction. 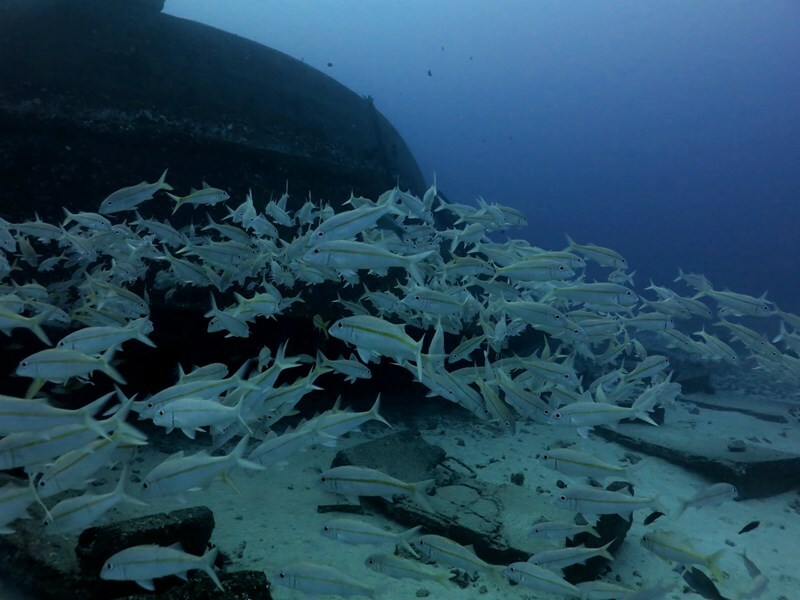 A few of the wrecks offer the opportunity for penetration, however most of the life is found outside. 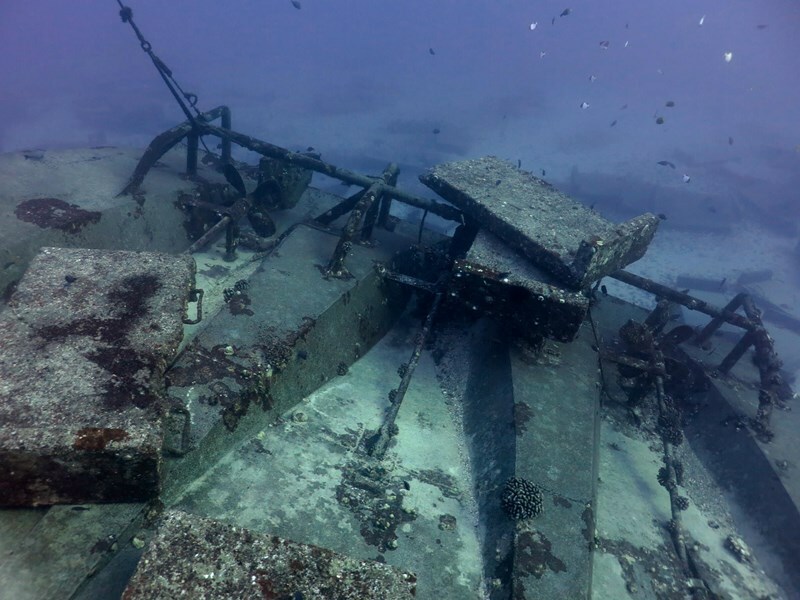 Many of the wrecks off Oahu have been underwater for some time, and have sharp edges – care should be taken when diving the wrecks, and good buoyancy is key. 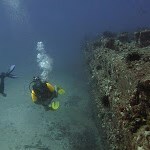 Because our Oahu wreck dives are deeper dives, bottom time can vary quite a bit depending on which wreck we hit. Ask us about extending your bottom time by getting your Nitrox certification. 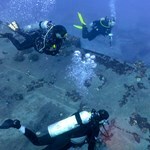 Additionally, all of our dives are led by a professional PADI instructor or dive master. 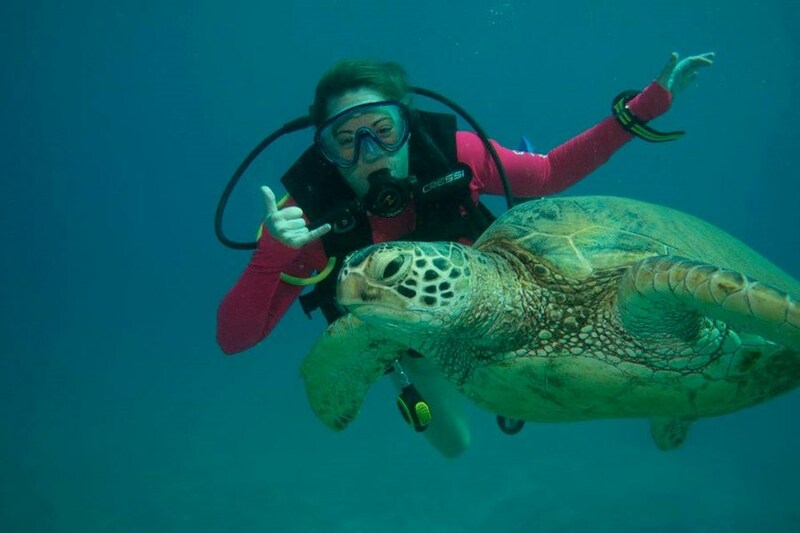 Let us show you the best scuba diving Oahu has to offer. 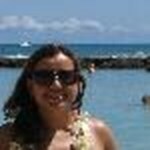 Yes, complimentary round trip hotel transportation from Waikiki area hotels. Do you own / operate your own boat? Yes! We own and operate our own 28′ dive boat; the Hapa. She is rated for 12 plus crew however, we limit our charters to six divers or less to insure a better experience for our guests. We have a 48 hour cancellation policy for all dive charters and a 72 hour cancellation policy for all certification courses and private charters. No refunds will be given for failing to show up or cancelling within the 48 hour or 72 cancellation period nor will refunds be given for dives you cannot complete. HOWEVER, if we cancelmall or part of a charter (such as weather and sea related issues), you can reschedule your charter or we will refund all or part of your fare, as appropriate. 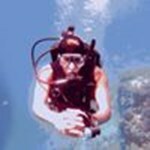 All of our dives are guided by an experienced, licensed and insured PADI professional Instructor or Divemaster. Is scuba diving equipment provided? Yes, we provide all the scuba equipment you will need. We also offer $10 off our dive prices if you need ONLY tanks and weights. How long do the dives last? Times can vary quite a bit depending on depth and air consumption rates. You will always start with a full tank (filled to 3000 psi). Dives end when we reach our maximum allowable bottom time, or begin to run low on air (700-1000 psi). We do not set specific dive times unless we are required to because of depth restrictions. 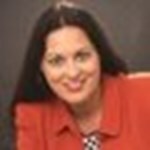 What type of equipment are you using / renting / selling? We use Cressi BCDs and Atomic Regulators. We also partner with Oceanic and Sea Sports. If you are interested in purchasing dive gear we can either have it shipped directly to your home address (save on airline baggage fees!) or you can pick it up in our shop. 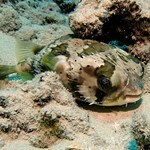 Do you offer underwater photo packages? Yes, we do offer professional underwater photography services. For professionally edited digital photos with all the pictures of your dives and a print release, we charge $85. Your photos will be made available in a secure on-line folder where you can download or share with friends and family. Divers can of course bring their own cameras and take as many photos/videos as they like. Do you provide snacks or drinks on your dive charters? Yes, we do provide a complimentary light snack (pastry, pineapple, cookies, etc) and water on all our daily Oahu scuba diving trips. How many days a week do you offer diving trips? 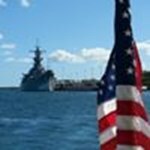 We operate 7 days a week and most holidays – we are also closed on the day of the Honolulu Marathon since the highway is shut down and make sit extremely difficult to access the Hawaii Kai area. How many people will I be diving with? We only take a maximum of six divers per dive trip, so there is never a crowd. What can I do about sea sickness? There are several steps you can take to avoid sea sickness. Products such as Dramamine and Bonine are designed to relieve motion sickness, however they also have side effects such as drowsiness. To avoid this, take one pill the night before you plan to dive, and another upon waking. Taking these products right before you get on the boat or when you start to feel sick will not help. Another alternative is Sea Bands. These are wrist bands that were designed to combat motion sickness by means of pressure points on your wrists. They have no side effects, and work for many people. You can find these products at most island drug stores. It is also a good idea to get plenty of rest and limit alcohol consumption and greasy foods prior to diving. We have a standard 48 hour cancellation policy for all dive charters and certification courses, and a 72 hour cancellation policy in effect for all private charters. Refunds will not be given if you fail to show for your scheduled dives or cancel your reservation with less than 48/72 hours notice. What a great experience I had with Pirate Reef Diving. Easy to book. Comfortable and safe ride and dives. Amazing marine life seen. Thanks Pete, Johnny and Orvil for an amAzing day diving. I will be back again and this time with my husband so he can learn with you guys. Thanks so much. 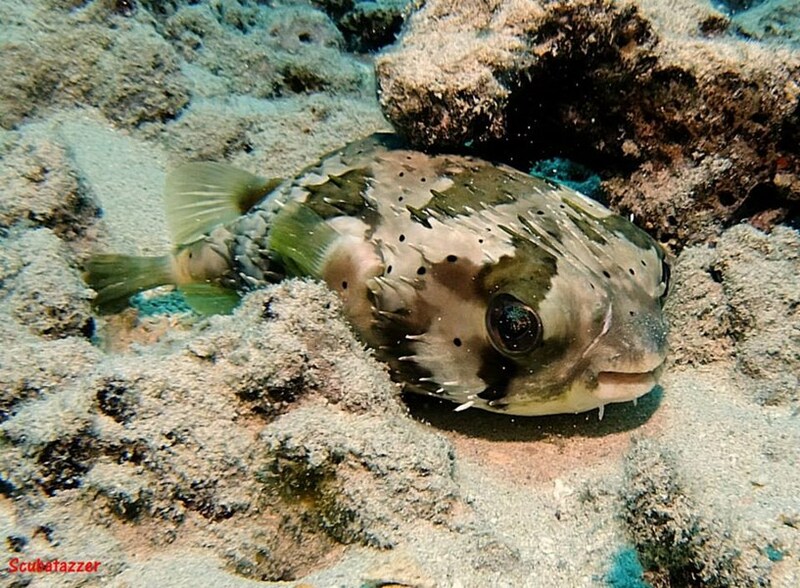 Furthermore with a maximum of 6 divers per dive trip, it is a much more personal experience and they really take the time to deal with any concerns and any questions we have on each dive trip. My dive trip this time with them was made even more incredible due to amazing weather allowing us to venture around the eastern tip of Oahu and to dive sites such as the "Sea Cave" where we were lucky enough to encounter a Monk Seal and also dive, sites that were further around past Hanauma Bay. This is the 3rd year that I have been on holiday in Hawaii and dived with Reef Pirates and not once have I been disappointing with the service they provide. I would highly recommend them to anyone coming to dive on Oahu. Tourists staying in Waikiki have no need to worry about transportation, they can easily come and organize to pick you up and bring you to the boat as well. You will start early in the morning! 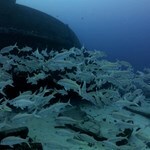 However, we realized that its worth it to avoid all the other ( and crowded) dive boats. Unfortunately, the winds were not in our favor that day. They were actually going the complete opposite way which made us stay within the bay, so no wreck dives :/. We did still get to do two dives that day. Saw a couple of turtles and at one point a ridiculous amount of puffer ... morefish! There was a feeding frenzy, over some fish eggs, we witnessed as well which was pretty cool. Both our dive master and boat captain were awesome, very helpful. Especially with the high ( to me, no idea how high they actually were) swells! The two other people that were supposed to go with us backed out ( maybe due to the winds?) but they still took us out to dive. I saw a huge dive boat filled with people coming into anchor as we got out of the water, this is the way to go people. 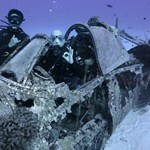 I would definitely come back to them again to check out the wreck dives! 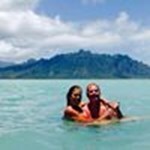 If you go diving on Oahu go with this dive company. Very professional and small group attention for possibly novice diver like me. Very nice to dive with such a small group. 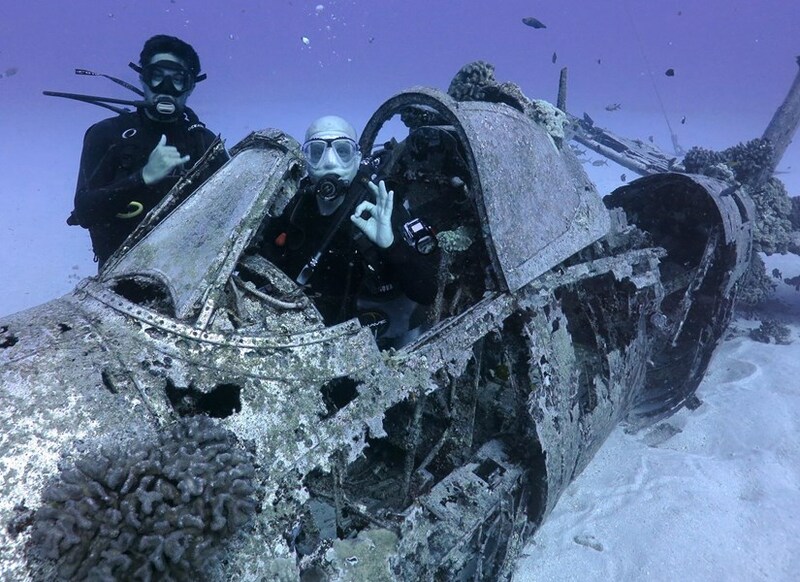 Two dives, corsair and a reef dive. Both Pete (captain / skipper) and Bud (instructor / guide) was very enthusiastic, professional and create a relaxing atmosphere. Felt very much at ease and have had a good diving experience. My wife and I dove with Reef Pirates today and we highly recommend them. The crew was terrific and the dive sites were phenomenal. Very friendly and helpful staff! We will be back. Excellent team and awesome dives even in bad weather. We had two dives with Reef Pirates everything was arranged and organized well and we enjoyed the dives, we saw many turtles, eels and more. I highly recommend to dive with them. I had my first official certified dive with Reef Pirates. 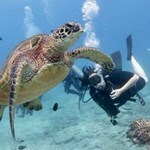 They have a great team of people - very friendly and knowledgeable of the reefs. It was a small group on the boat (4 guests to 3 staff members) and they were very focused on safety. I even got to do a dive 1-on-1 with the divemaster since I was the only certified guest. We saw lot of turtles, fish and eels. 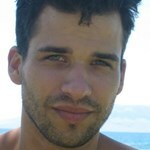 I felt very confident using my new ... moreskills with them and I will definitely dive with them again. 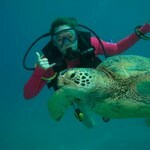 I won't dive with anyone else anytime I'm back in Oahu! Only 4 people on the boat together with 3 dive instructors- fabulous! Perfekt organized and easy - we loved it! Very professional and safe. The crew is awesome. They do a small boat for better dives. The safety diver checks on you throughout the dives. Highly recommend diving with them. 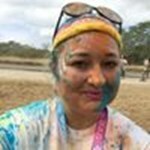 I tried to Reef Pirates by a recommendation of the instructor who accompanied us on the dive on Kauai. 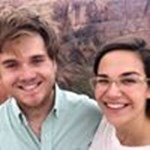 My husband and I had never done a deep dive, it was the first time. 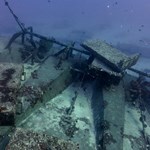 They knew we did not have experience, so they chose a Wreck Dive less deep to do that day (27m), plus a shallow dive. I loved it! I felt safe the whole time! 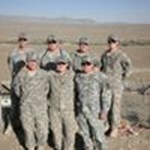 All of the company were very attentive and friendly, giving us all the ... moresupport we need. Unlike other dives we did in Hawaii, breakfast was not served, just snacks enough for warmth between a dip and another and water. But I found the price fair enough! What I liked the company was the fact that they never do a tour with many people, are always at most 6. In addition we left early, arriving at the point of diving ahead of other companies. I think so when we got down there the animals are more in sight, they are not hidden because of the movement. Spent 5 days diving with Reef Pirates and could not be any happier. I have been diving all my life and I don't think that I have enjoyed diving with any other group more than with Reef Pirates. A super bunch of guys. They really enjoy diving and it shows. We had great visibility and visited multiple sites. Saw everything one could wish to see. The early start means you have the sites to yourselves ... moreand have lots of time left over after diving to spend with non-divers. Many thanks to Sean, Pete, Scott and their awesome photographer Orville. Until next time Aloha! 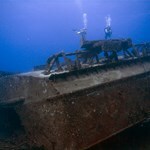 Reef Pirates Diving provides outstanding service. First and foremost, they limit their group sizes to six divers. The other dive companies appear to be all about the big numbers. (Trust me on this one: I saw the competitors' boats as we'd pass by them in the channel.) Second, this company also has the earliest dive times so that you are the first, and usually only, group at the dive sites. This dramatically ... moreincreases your probability of seeing things before other divers scare them off. Plus, the early times free up the rest of your day to do other things. Third, Reef Pirates Diving is full service. They set up your equipment, change tanks in between dives and break down all of your equipment at the end. You don't have to do a thing. Fourth, Reef Pirates Diving has complimentary pick-ups/drop-offs from/to any of the Waikiki hotels. You will want a ride. The traffic in Waikiki is a nightmare and taxis are very expensive. Fifth, Reef Pirates Diving does not charge for equipment use. Wetsuits, BCDs, regulators, tanks, weights, fins, masks are all free. Sixth, they take photos of you during the dive at no charge. I appreciated this because I have thousands of dive photos, but only two or three have myself in them. So, this free service is a huge perk because most other companies take photos but charge you up the arse. Reef Pirates Diving simply posts the photos on Facebook and you download them from there. Last, but certainly not least, there is great communication in booking dives, finding out information, etc. I sent numerous emails to the company prior to my dives. They always responded promptly and answered each and every one of my questions. -- Highly, highly, highly recommend!!! Sean and his crew went out of their way to make sure we have great dives. Extremely professional yet layed back. What sold me was that they own their own boat and leave earlier than the other companies. This means you get a great dive with a small group before everyone else on the island scares the fish away. I would definitely dive with them again. Sean and his team without the best. 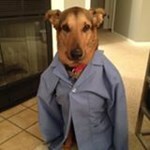 They are very punctual, friendly, funny and professional. They did all my dives and were very good and funny. 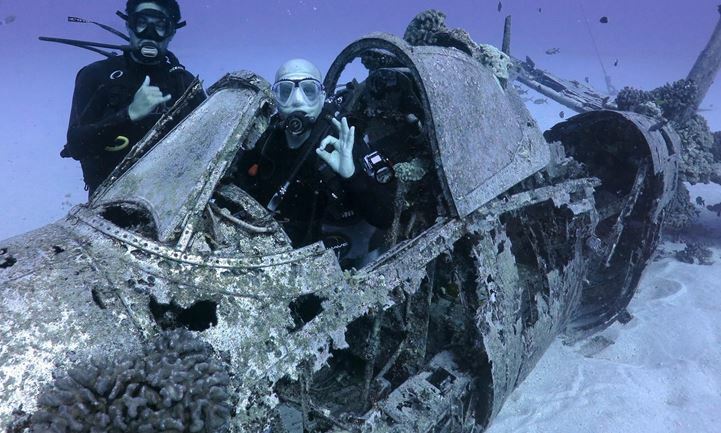 One of the best things is that there is never more than six divers on the boat and when so warranted, the group is even divided into two, according to the skills they have observed, that's great. 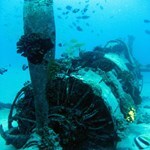 We visited reefs and wrecks, it was sensational. I have the ... morebest memories and , most important new friends. 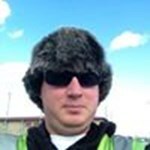 Thank you very much Sean, Justin, Dan, Kathleen, and Orvil and Scott who are part of them. It was great!